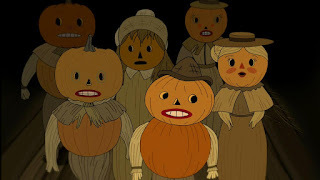 It feels awfully appropriate, now that October is well underway and Halloween approacheth, that I finally sat down and watched all of Over the Garden Wall. OTGW, if you haven't heard of it, is an animated miniseries that came out in 2014 and actually won an Emmy for Outstanding Animated Program. 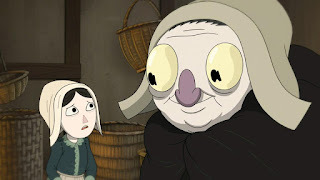 Very much in the vein of Adventure Time and Steven Universe and the going renaissance of children's animated television, OTGW is weird and kind of frightening and very very good. It's also absolutely completely baffling and I don't get it at all. Yay! Before we get really into this, I do want to give a couple of works about Over the Garden Wall's format. Available on DVD and some streaming services, the show comprises ten episodes that are each only eleven minutes long. So it's not just convenient, it's freaking easy to watch the whole show in a single sitting. That's less than two hours worth of material. And, if you are considering watching it, I suggest treating it like a complete whole. Watching the first episode really won't give you much of an idea of what it's really about - you have to watch the whole thing for it to work. It's more a serialized movie than a show, to be honest. You know, like a miniseries. Which is what it is. 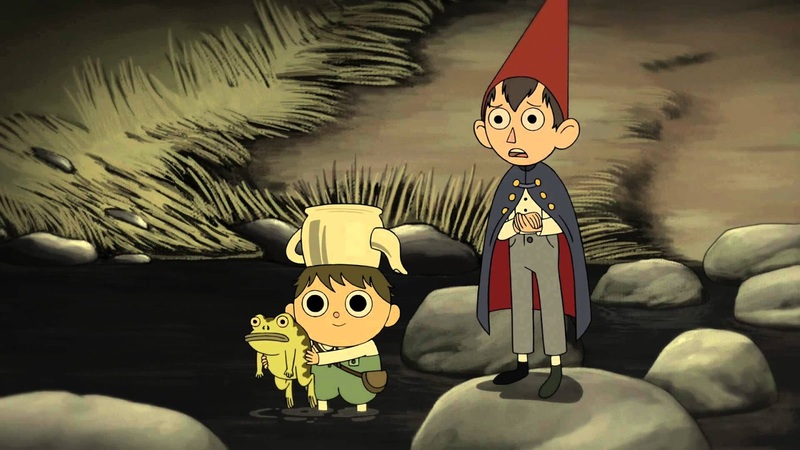 As they wander through the woods, Wirt and Greg come upon a variety of creatures and people who live there or are also passing through, all of whom seem to be living in some slightly different version of this same place. As in, no one appears to be quite in everyone else's reality, and as they travel through, they discover places that even the people who live there have never heard of. But there is a larger plot going on here. Obviously there is the larger plot about Wirt and Greg trying to get home, but there's also a battle between good and evil (sort of) going on in the background. And that's what I want to talk about today, because that battle is what makes it seem like Over the Garden Wall is actually a story about death, the afterlife, and making the most of the life you've got. Plus it's just really interesting from a storytelling standpoint. So in the very first episode, Wirt and Greg are already lost in the woods but not quite as clear how far they are from everything they know when they stumble on a woodsman. The woodsman is super creepy and Wirt doesn't want to trust him, but Greg happily follows the guy back to his mill where he explains that he grinds up Edelwood trees to make an oil which he uses to light his lantern. He must keep the lantern lit no matter what. The reason for that is simple: there is a beast who stalks these woods and who might eat the boys alive if he finds them outside. The lantern is the only thing that can keep him at bay, or so the Woodsman (Christopher Lloyd) tells them. That night, Wirt and Greg have an encounter with the beast, or what they think might be the beast, and it seems like they get the best of it. Only, as the story goes on, it becomes utterly clear that this was not the beast after all. Or maybe just a little piece of the beast. The story is confusing. Point is, there's still more beast around and it's still trying to get the boys. 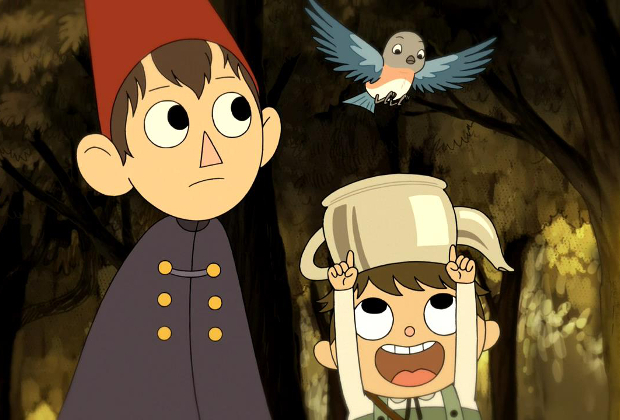 In fact, the whole story is much less about Wirt and Greg's adventures - though that forms the majority of the screentime - as it is about the Woodsman and the beast competing for the boys' souls. Like, very literally competing. The Woodsman keeps entreating the boys to keep their spirits up, because if they lose hope then the beast can get them. But then they run into a town that insists that the Woodsman actually is the beast, because his lantern is the sign by which they recognize the beast. And the beast himself keeps throwing obstacles in their way to discourage and dishearten them. In other words, the real battle here is a mental, emotional, and spiritual one. As long as Wirt and Greg keep hope, then there's a chance they can go home. As soon as they give in, they are trapped forever in Unknown. But, at no point is there a guarantee that they will get out. It's all up in the air, it's all a matter of faith. That, I hope you can tell, is what makes this story interesting. Each little unfolding of the story adds more weight to what's going on and makes it every so slightly more bizarre and intriguing. Like, SPOILERS, when we find out that Wirt and Greg are not from the vaguely middle ages time their clothes suggest. Actually they're from the present* and are just wearing their Halloween costumes. That means that they somehow fell into this fantasy world from a time very different from it. And then there's the moment when we see a gravestone in the modern cemetery that has the name of a person they've met on it. Or how at the end (SUPER SPOILERS), they wake up in the hospital. Some people have speculated that Unknown is actually purgatory or the space between life and death or something like that. All of these are pretty valid and interesting theories, all based on the little clues dripped into the episodes - I mean, there's even the question of if the lantern is actually the beast's soul, a question that we never actually get answered. I guess what I'm getting at is this: I have no idea what is going on in Over the Garden Wall. Seriously. None. But I really like it. Normally an abundance of tone and a dearth of plot drives me absolutely nuts, but I think this is one place where it really works. Because the story here is so metaphysical, but still a very present and important part of the series, the vagueness of what exactly is happening doesn't feel wishy-washy, but rather like a necessary part of the show. You aren't supposed to know what's going on, not exactly. That's the point. Right? This is a show about death, sort of, and also family and relationships and standing up for yourself, but it's above all else about being lost and afraid and not sure what to do. The ambiguity isn't an accident. It's not like the writers and directors and animators all just sort of forgot to answer any important questions. This isn't Lost. 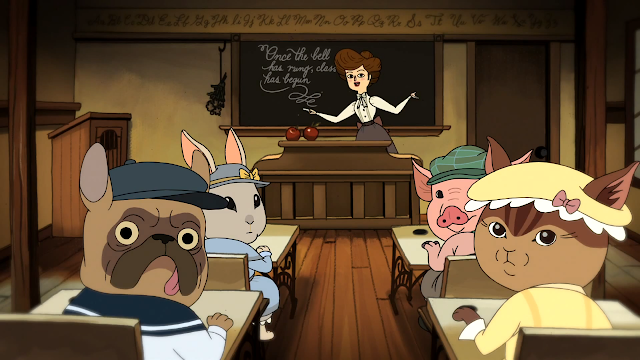 Over the Garden Wall's ambiguity is intentional, a story choice that underlies the entire story. I think that while this show is pretty unambiguously about death, it's also in a lot of ways about life. I mean, life is a thing where you are, for the most part, wandering around with no clear idea where you're going and where you should be going. You don't have a map, the people you meet along the way might be there to help you, but they also might not be. And if you lose hope, you're going to stay lost forever. The only way to keep going through is to hold your hope close to your chest and take things as they come. So the show is about death and also about life - it's mysterious on purpose, and as far as it goes for children's television, the mystery is something I really appreciate. I mean, so much in your life is an unknown, but it seems that when we make stories for kids we insist that they have clear morals and resolutions and that they always make sense. Why? Life doesn't typically make a whole lot of sense. It doesn't follow narrative structure. It tends to only make sense when we look back and trace the path we've made. 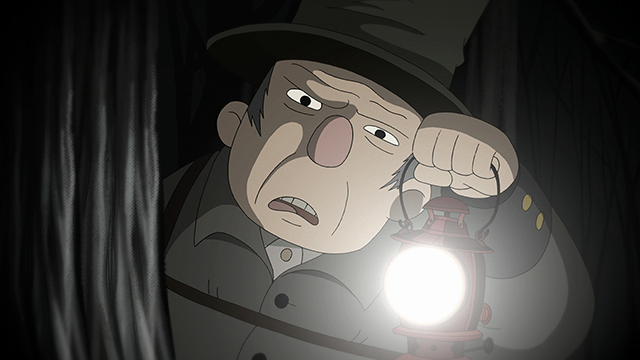 The value of shows like Over the Garden Wall is that they create an understanding of ambiguity. They tell kids that everything might be scary and confusing, and that's okay. That's normal. Scary and confusing are things that happen. If you're naturally buoyant, like Greg, then you can pretty much waltz your way through. But, if like Wirt, you need some time to prepare for the weirdness the world can throw at you, then I like that this show operates as a sort of warning. Things are not always as they appear. The monster might be hiding in a sweet young girl, but then again, maybe you can help her anyway. The beast has a weakness and the light might actually need to go out. Your life probably won't make a whole heck of a lot of sense to you as you're going through it, but chances are you'll get through just fine. That's all stuff that kids really do need to hear. It's worth saying and showing and creating an entire miniseries just to get across. I get why shows like Over the Garden Wall are good and necessary, and I love that we live in a golden age of children's animation where such complex issues are really being addressed. I mean, this show goes into so much that's usually called too deep or frightening for children: despair, sacrifice, overpowering guilt. It does it all because these are issues that children too face, and I love that. But I don't "get" Over the Garden Wall. I really don't. Which is, I think, as it should be. *Roughly. I'd actually estimate it as the 1980s or so, based on the mix tape and the cars and the general clothes. Fun fact: the hospital where With and Greg are taken is in the same city where the characters of the show "Clarence" live. That is an awesome easter egg. I wouldn't have noticed that.